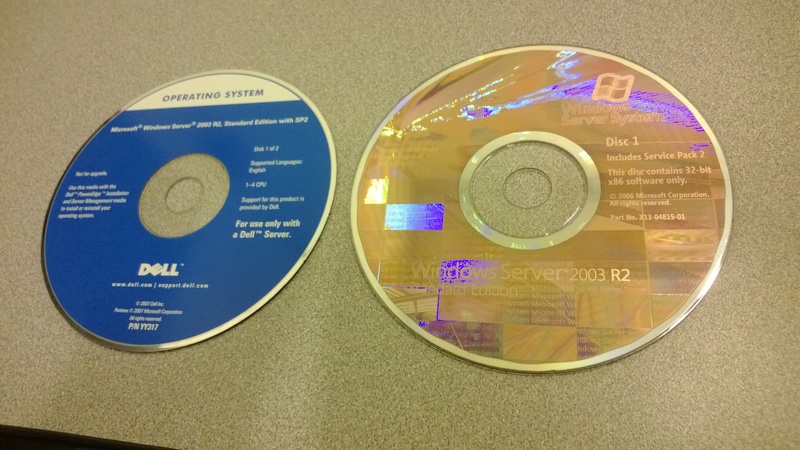 We are working on a disaster recovery plan and one thing we don't currently have are the original install disks for our server that has Windows 2003 Enterprise Server R2 (32 bit). Is there a location this can be ordered or downloaded? With Server 2003 Enterprise R2 being end of life, Dell no longer maintains stock of it. You would need to go to somewhere like MSDN, or Technet to download. Right, but the problem is MSDN and Technet aren't going to have the OEM version of it; when you install and it asks for the key, the versions of the software on MSDN and Technet reject the product key we have for the OEM version. We therefore truly need the original Dell disk. I understand that Dell isn't going to have a bunch of these in stock forever, but my hope is that somebody here, Dell employee or not, has one in a drawer somewhere and can burn/send a copy, make the ISO available for download, etc. You could try looking on auction sites to see if someone is offering the disks. Assuming you have a license (sticker with key) on the server, in theory any OEM 2003 media would work, but depending on the server it may need a minimum service pack level to install (though you can add a service pack yourslef with tools like nLite if you have the OEM media). Remember that you purchase a license - the right to use the software - you do NOT purchase or own the software itself. So, you should already have the license - you just need the installation media. Microsoft softened their approach to activation in V/7/2008/2008R2, allowing an OEM key to activate Retail media, but that was not the case with 2003 ... that is Microsoft's issue, not Dell's. Microsoft sets the rules for OEM's for things such as media distribution, and while yes, it is Dell's responsibility to distribute the media, how long is feasible to stock it? Should I be able to call Dell and request Windows 98 media for my first computer? Sure, it would be nice if they did, but Microsoft does not require that of OEM's (and their policy likely already adheres to any applicable laws), so likely none do it voluntarily as simply a favor to the customer. Dell stopped stocking 2003 media 4 years ago, and it isn't just them. Also, Dell doesn't distribute authentic retail Microsoft OS media (hologram), and if they did, it would come with a Retail key, and there wouldn't be an issue activating. Dell's media is Dell-branded/labeled OEM Windows media. So, if the media has been lost, you just need to find it ... partner or neighboring companies, local tech firms, schools, or the likes of eBay might be the best options for obtaining the correct media for the license you likely have (OEM). Not trying to get into the politics of this at all so not going to bite on that. I have looked on ebay, have even searched torrent sites, and no luck. I'll even come right out and say "Shame on us for losing the disk in the first place." But what's done is done, and I'm in need of the disk. Having exhausted checking local tech firms, schools, eBay, and a shady guy named Guido who has been known to locate items from time to time; I am asking this community if anyone can help. It doesn't really matter if I believe Dell should have a 10 year old CD or not; it doesn't change the fact that they don't. I could be angry at Microsoft, but anger at Microsoft isn't going to magically produce a disk out of thin air either. So the question remains: "Does anyone here have the disk, and a willingness to put the ISO out somewhere I can download it, or burn a copy and send to me?" Many thanks for help. The issue I'm running into is that it was Dell's fault for not supplying me the right disk in the first place. I didn't lose it- I never got it- they sent me the Microsoft "halogram" version instead and now I'm stuck like the other posts I've found to try and get something that I originally paid for? Dell should work with Microsoft on this, not each consumer trying to solve this. Sure there's hacks out there to get it to work, but why should I have to hack something that should have been supplied to me in the first place. I'm just glad that this is a server that is not in critical need or i'd really be about this. I have the same problem too but mine is 2003 R2 Standard. Can you share exactly the same iso file in the picture (Dell OEM Window Server 2003 R2 Standard Edition) cd media file to me?